Welcome to my Web site. On it I am cataloging Dead Can Dance, Lisa Gerrard, Brendan Perry, and 4AD items - mainly so I can get a handle on what I have in my personal collection and what I still need to acquire. Please come in and check around. If you have any information on items not on this site, please drop me a line with the details. Details are here. (I first saw this posted, along with the image, on the Brendan Perry Fan Club facebook group. Go join it!! 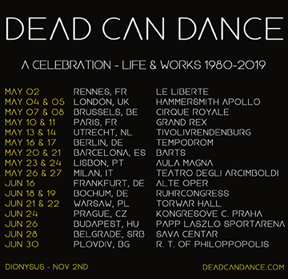 18.10.29I have started a Dead Can Dance Library facebook page. 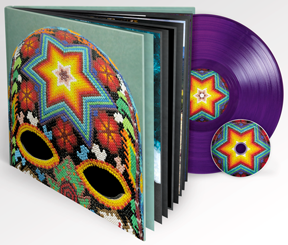 18.09.05The new Dead Can Dance album, Dionysus, releasing November 2nd!! You can order it here. - - I have some pictures up of my collection. Soon(ish) I will put up some videos talking about specific releases! 18.09.05And a concert tour is in the works!! 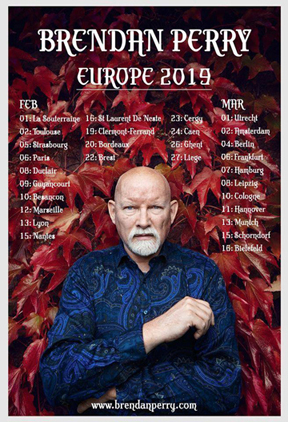 The European Tour tickets are on sale (or going on sale soon) - check here. 18.02.18I am adding more things to this site!! I have begun adding "placeholder" info for new items. The fuller revamp is taking way, way too long, so in the meantime I am putting up a single image for items I have. There won't be much additional info, but it still might be interesting. Example: I have added a number of Polish audio tapes here. 18.02.04Lisa Gerrard has a whole new site! It is wonderfully clean, with links to interviews, concerts, and more. Check it out here. 17.11.12Listen to Brendan Perry on the track "No Land"
Olivier Mellano, Brendan Perry & Bagad' Cesson worked on "No Land". You can stream or download from here. 17.11.12Brendan Perry did the music for the movie "Dream Song:! Brendan did the music to Dream Song - a non-English article is here. 17.10.29Lisa featured on the track "Spirit Guide"! Lisa is featured on "Spirit Guide" track on Engine-Earz Experiment's new album "Symbol". Links for all variety of products, includng the bundle, vinyl, digital, and CD, here. 17.10.23"Pora Sotunda", the advance single, featuring Lisa!! Lisa is featured on the new album: The Mystery of the Bulgarian Voices - Le Myst�re des Voix Bulgares!! Thank you to those who help with info on the world of DCD/LG/BP!! !